As soon as a conservative Republican emerges as a serious presidential frontrunner, liberals in the media suddenly yank out the microscopes they’ve been keeping away from Barack Obama since 2007. They could care less what Obama did in college, how he got into college, who paid for his college, who wrote his letters of recommendation, what his grades were, and on and on — but we already know everything about Scott Walker and college. Obama’s media protectors could give a rip that he had a mentor who was a literal card-carrying member of the Communist Party in the Stalin era. But as soon as someone like Scott Walker starts gaining ground, wow, “journalists” lunge for the magnifying glass and became real reporters again, profusely digging and questioning, looking for molehills to make into vast mountains of scandal. The answer was immediately blasted. It shouldn’t be. It’s fully appropriate and necessary for Walker to clarify that he was not equating Wisconsin public employees with ISIS, and to apologize for any such ridiculous misunderstanding, and it’s also appropriate and necessary for his opponents not to abuse his point. Abuse his point? Yes, because he made a good one. The truth is that it isn’t easy to do what Scott Walker did as governor in Wisconsin. That’s the main reason he so impresses conservatives. The enmity and utter hatred that he and his family and extended family (including his elderly parents) felt constantly, from union members and their militant “progressive” allies in his own backyard, at the state house, in the halls, at his office, in his neighborhood, at his church, at the grocery story, at Starbucks, at the car wash, on the street, at Boy Scouts meetings, at soccer games, at dance practice, at baseball games, at theaters and musicals, and on and on and on, is something awful that people can scarcely imagine enduring. Public-sector union thugs can be brutes and can make your life miserable. For Walker, it equated to a nasty pressure that was omnipresent. In a way, it really would be more personally distressing than a president dealing with ISIS because the president, fully protected, never gets anywhere near an ISIS killer. The president faces no personal harassment from ISIS members. That’s not true for Governor Walker. It’s a point that Ronald Reagan could have related to. Asked about dealing with the Soviets, or Brezhnev or Gorbachev, Reagan often told reporters that he could handle them because he still had “scars on my back” from fighting unions. Was Reagan thereby insulting, say, the boys who invaded Normandy and fought at Iwo Jima he experienced true hand-to-hand combat? Of course not. We know that. Reagan arrived at the gas station and answered the phone. “I was told,” he said later, “that if I made the report a squad was ready to take care of me and fix my face so that I would never be in pictures again.” Specifically, the caller threatened to splash acid upon Reagan’s unsuspecting million-dollar face—the source of his livelihood. Such fears were nothing new for Reagan. Police began guarding Reagan’s home and children, and he began packing a Smith & Wesson revolver, which he took to bed each night. 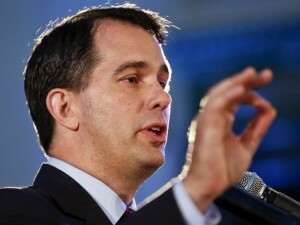 The vituperation and dripping, red-hot anger directed at Walker by unions in Wisconsin was a sight to behold. What he endured in Wisconsin was extremely distressing. But don’t expect Walker’s opponents to try to understand that. Second, another Walker-Reagan comparison/clarification is in order. I tried to ignore it, but now Peggy Noonan has weighed in. I think I also need to step in. That was Walker’s response Jan. 21, 2015 when he was asked on MSNBC’s “Morning Joe” about the importance of foreign policy experience. First, the governor criticized the secretary of state record of Hillary Clinton, the leading potential Democratic candidate for 2016. Then he turned to Reagan, one of his political heroes, and one of the Republican president’s early acts in office — the mass firing of most of the nation’s air traffic controllers…. So, Walker goes beyond stating an opinion about the foreign policy implications of Reagan’s move. He states as fact that there are Soviet documents showing the Soviets treated the Reagan more seriously because he fired American air traffic controllers. When we asked for evidence to back the claim, both the governor’s office and Walker’s campaign cited statements from a variety of people. Each essentially said the firings showed Reagan meant what he said, and that he was to be taken seriously. Those are perceptions of Americans, however. [Actually, no, it was Americans reporting Soviet perceptions.] Walker’s claim was the Soviets treated Reagan more seriously after he fired the controllers, and that Soviet documents prove it. But he did not provide us anything referencing Soviet documents. And apparently there are no such documents that have been made public. Ah, that’s the issue? The lack of “documents?” That’s the big deal? But why? Tip O’Neill apparently talked to “Soviet leaders” and Edmund Morris’s sources were “former Soviet apparatchiks.” And George Shultz dealt with the Soviets daily. Surely that’s a solid-enough measure of evidence. But the issue, apparently, is “documents.” No documents. Frankly, I hadn’t even noticed in my initial read that Walker used the word “documents,” even when I first read his statement on MSNBC. It went right by me. And I specialize in dealing with Cold War documents. James Graham Wilson, a historian at the U.S. State Department, also told us he was not aware of any Soviet documents showing Moscow’s internal response to the controller firings. He speculated that there could be such records, given how some Soviet experts characterized the firings. Whoa. Now is that fair? The minute that this PolitiFact item was released, I got an email from a fellow Reagan expert who was really steamed. “Paul, you’ve got to take this on!” he wrote. I didn’t want to take it on. I instantly recognized what Walker was talking about, and was mystified by the harsh reaction. I recalled the PATCO material being published in Peggy Noonan’s and Edmund Morris’ books, and elsewhere. Because a politician in an unscripted TV interview referred to documents rather than reports by biographers, he’s a liar with his pants on fire? Should we hold a governor to the standard that we do scholars because he used the word “documents” in an off-the-cuff remark to a TV guy? Do we expect our politicians to be archival experts in Cold War documents in order to make general points with the utmost academic-scholarly precision? Clearly, Walker had indeed correctly read that the Soviets were impressed by Reagan’s actions, and just as clearly assumed (understandably) that the authors he remembered writing about the incident (being authors) probably had used some sort of “documents” for their research. Does anyone really think that Scott Walker lied here? Please, give me a break. If I may dare say this, I guarantee you that I could start digging in archives, and especially the voluminous Soviet media archives that I’ve collected over the decades, and find you an example of Moscow officials communicating about Reagan and PATCO. It might take me hours or days or even weeks, but I can find them. I assure you I can. I have read hundreds of Soviet memoirs, and I could go back through and start checking those, too. If PolitiFact wants to pay me for my time (by the hour, please), I’ll start looking. But I warn them: Finding actual “documents” is never easy. It always takes a lot of time. So, this could cost them. Another warning: Such “documents” probably will not be a big deal. They would likely simply offer a written communication of what we already knew, a mere hardcopy communication from one Soviet official to another. That’s all that “documents” often are. So, I could dig a whole bunch for this stuff, but I doubt what I find would really add anything of value to this apparently scandalous episode. For that matter, can PolitiFact fairly and fully judge Walker wrong without itself having dug deeper for these apparently amazingly crucial documents essential to buttressing a point that respected writers and public officials received regardless from Soviet officials? Was Tip O’Neill lying? Edmund Morris, too? Did George Shultz never hear any such thing from Anatoly Dobrynin or Andrei Gromyko or someone in the Soviet foreign ministry? That’s right. I’ve shared thousands of perceptions from people in articles and books I’ve written. The vast majority, I’m sure, were never recorded in documents. Bill Clark, Reagan’s closest aide in the attack on the Soviet Union, had an explicit policy of not writing down sensitive information that he and Reagan feared could be leaked. Boy, if I could’ve had just one of the many napkins or paper scraps that Clark scribbled on after his meetings with Cardinal Pio Laghi, John Paul II’s apostolic nuncio in Washington, which Clark then took to Reagan to refer to while briefing the president. Unfortunately, Clark always dropped them in the trash. The lack of those “documents” frustrated me as his biographer, but that was the way it was. It didn’t mean that those communications didn’t happen. Here again, like the ISIS-union example, let’s focus on the point that Scott Walker was trying to make, the gist, the forest rather than the trees. In all of this, Scott Walker has unintentionally identified with something else he evidently shares with Ronald Reagan: the media’s ability to place every inexact word of his under microscopic scrutiny and trounce him when he isn’t perfect to the letter of the word. This is something the media does not do to Barack Obama—never has and never will. As Scott Walker moves on, he can expect to get much, much more. Ronald Reagan certainly did. Don’t let it bother you, governor, you’re in good company. The facts really don’t matter to the propaganda media. If an candidate like Scott Walker doesn’t misspeak than the propagandists will put the words in his mouth and invent lies. The genius of Ronald Reagan was that he did not apologize for his statements nor did he try to explain them. Remember when he said that we’re embarking upon a new era – that’s era not ERA. That one sent the gossipers into a frenzy and they burned out because he let that statement stand. The last few candidates were backpeddlars, they paid the price. The only way to victory in 2016 is up the middle. I think Scott Walker has the mettle to do that. We need to encourage him in just those kind of truthful and winning remarks.